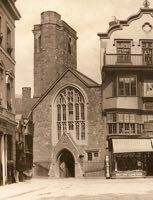 This is one of the oldest churches in Exeter and was consecrated by Bishop Leofric on 6th July 1065. As Bishop Leofric came from Burgundy, the church was dedicated to St Martin of Tours, the patron saint of beggars. Some original Anglo-Saxon stonework in the walls remains from this period including the use of Beer stone. The church is on a cramped and skewed site, forcing the nave and chancel onto different axis. Most of the church was refurbished between 1420 and 1455, including the west window which was presented by Bishop Lacy, while the furnishing dates from the 17th and 18th-centuries. The roughcast tower is built of red Heavitree sandstone. 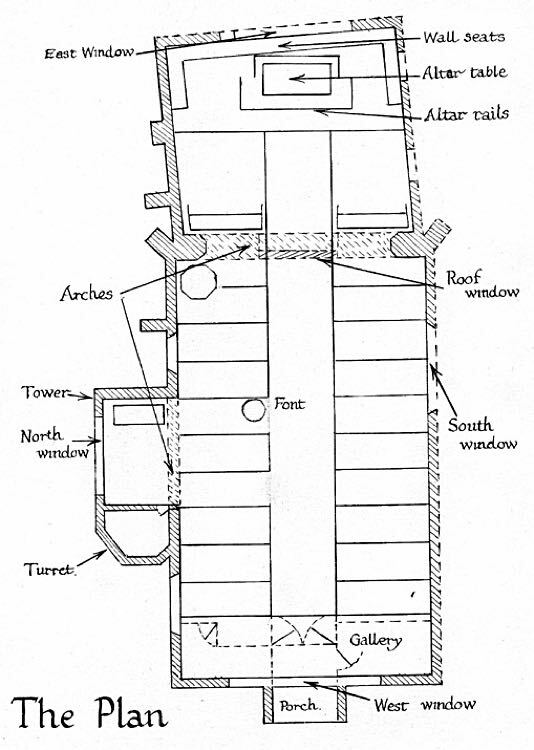 The roof is a typical Devon style 'wagon' roof, although the mullions are made of wood, rather than stone. The porch was added in the 19th century. Inside, the altar table, altar rails and communion wall seats are Jacobean in period. The font was made in two halves, the upper marble section of a later date than the lower part. The church has several interesting memorials, including one to the Hooper family, and the window on the south side has the coat of arms of the Kingdon family, probably donated by 'Iron' Sam Kingdon. 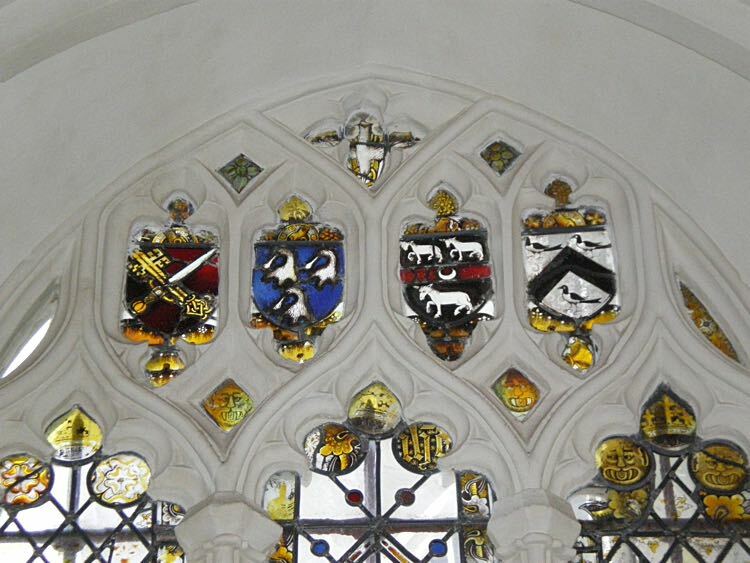 The coat of arms of Charles I can be found on the south wall, probably after it was hidden in the tower after the Civil War. The text of the Creed, Lord's Prayer, and Ten Commandments, are on panels behind the altar, but were painted over at some point–they are now uncovered. 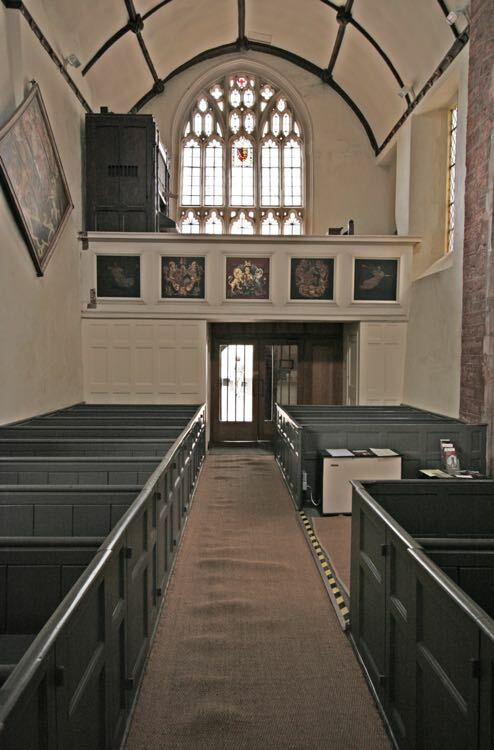 Unusually, the altar is surrounded on three sides by a rail, a practice adopted in the 16th Century, after rood screens were removed during the Reformation, rather than the later, more common practice of a rail crossing in front of the altar. There is a 17th Century gallery at the west end, under the window. The window was in the 1970s, in a poor state of repair, and was recommended that it be replaced, but after consideration, it was preserved and 75% of the original remains. The gallery has five panels, the first and last being painted with trumpeting angels. The remaining have the arms of the See of Exeter impaling "argent a chevron sable,'' the arms of Bishop Trelawney (1689-1707) and then the royal arms, and the arms oof the city of Exeter. The single bell weighs about 11 cwt (550 kilos) and was cast in 1675 by Thomas Pennington III from Exeter. Cast on it are the names of Nicholas Tripe, John Mason, John Brewer, Wardens, and two satirical medals with heads of a king and a pope, a bishop and a cardinal. 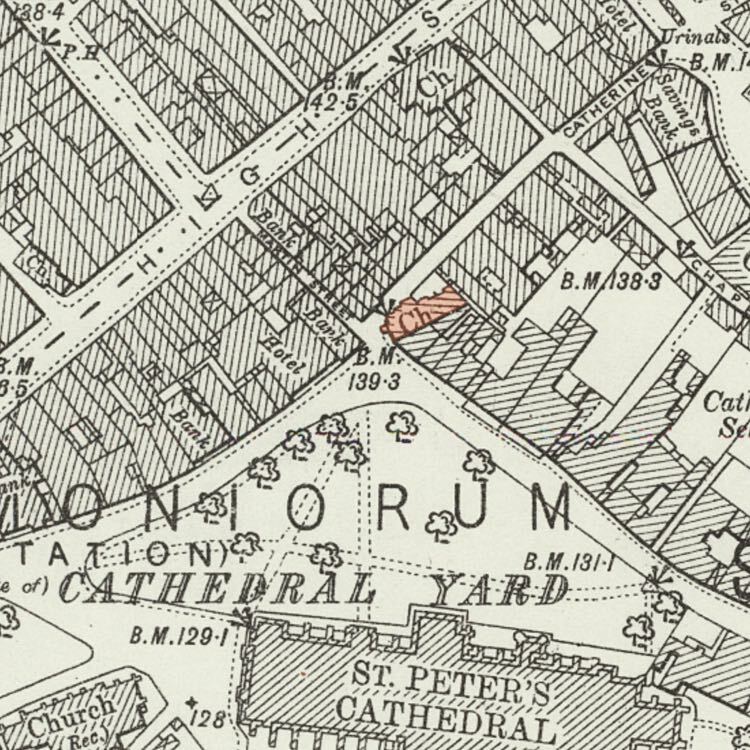 The defunct parish of St Martins stretched from Broadgate to St Martins Lane and the High Street to Cathedral Yard and covered only 1.75 acres (0.7 hectares), in a self contained 'island'. In 1821 there were 329 residents in 62 houses, and dropped to 207 in 1867–now there are no residents as all the houses are shops and offices. 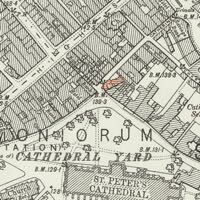 In 1886 there was a plan to amalgamate St Stephens and St Martins. At the same time, a scheme was proposed by a member of the Streets Committee, to extend Queen Street across the High Street by widening Martins Lane, cutting across Catherine Street and demolishing the Swan Inn and the houses that were on the site of the present Oddfellow's Hall, pushing past the rear of St Martins Church, through the gardens at the rear of the houses lining Cathedral Close, down as far as Southernhay. Suffice to say, it was not supported; it seems City Councillors have always been megalomaniacs. The fire in October 2016 that destroyed the Royal Clarence Hotel threatened to spread to the High Street, to the rear of the hotel, The Ship inn and Gemstar in Martin's Lane and St Martin's Church. The heat from the fire was intense, and the fire service covered the old church with foam to protect it. Despite the loss of the hotel, and the work to clear it and rebuild, St Martin's Church is still a quiet, tranquil island in this corner of Cathedral Close. The registers date from–baptisms, 1784; marriages, 1754; burials, 1783. 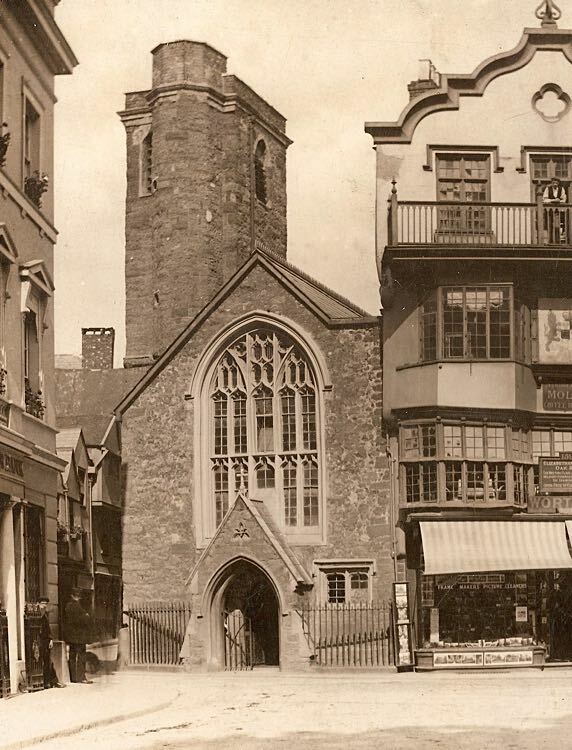 A photo from about 1890 of St Martins. 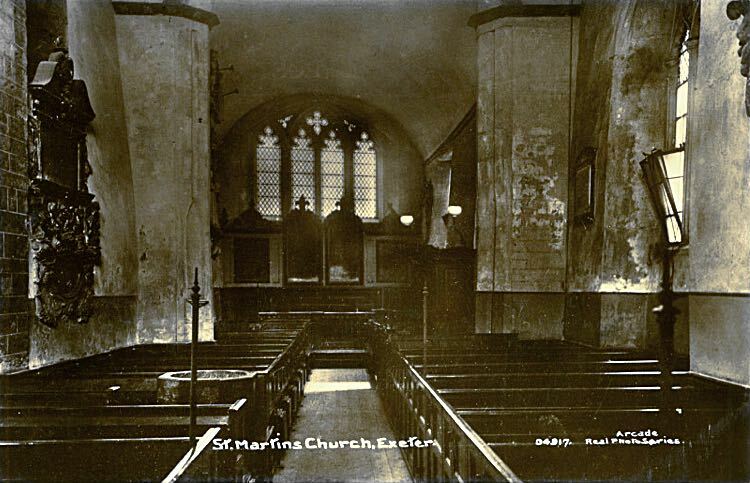 The interior looking east from an early postcard. The interior looking west, contains the gallery over the entrance. Detail of the stained glass window in the south wall. 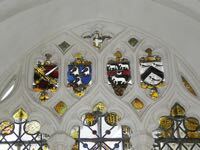 The coat of arms, top right is for the Kingdon family.